We are a team of ASE certified mechanics that have created this guide to show you why your brake pedal goes to the floor and what you can do to fix it. Before beginning your work and inspections place the vehicle on level ground with the parking brake set. Use a basic set of tools while wearing protective eye wear and gloves. Problems are presented in order of popularity. The car may need to be jacked up while using jack stands. Check the Brake Fluid Level: Anytime you have a brake pedal that goes to the floor raise the hood and locate the brake master cylinder's reservoir. Using a flashlight check the level of the fluid or just remove the lid of the reservoir and look inside. 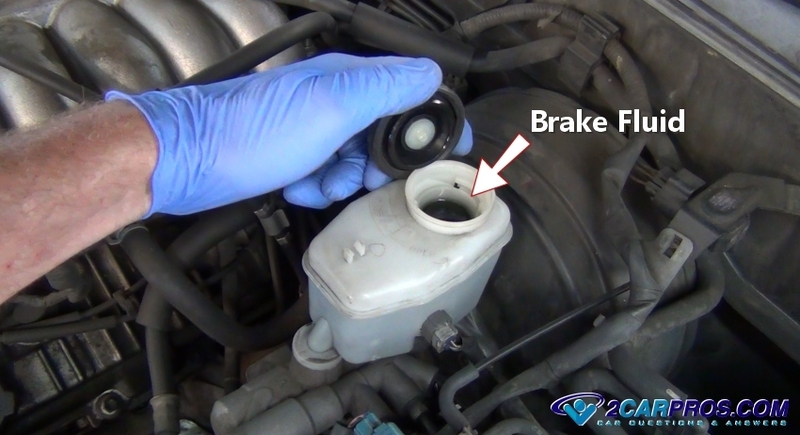 If the fluid is full then continue onto "Brake Fluid is Full" down further in this guide. If the reservoir is empty then either the front or rear brake pads need to be replaced or their is a leak somewhere in the brake system. 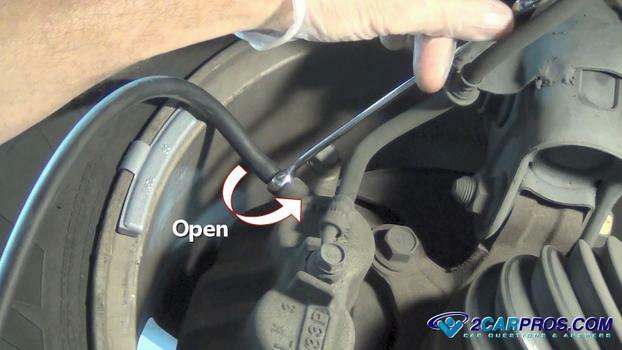 Inspect for Brake System Leaks: Using a flashlight check the rear of the master cylinder where it bolts to the brake booster. If the master is leaking you will be able to see brake fluid dripping from the front of the brake booster and rear of the master. 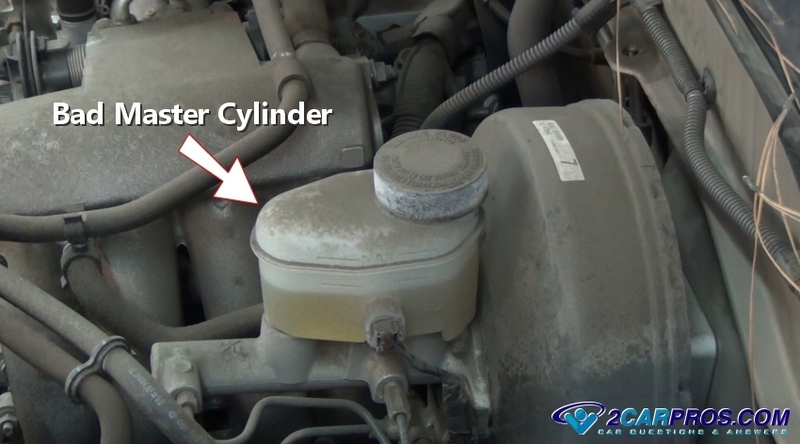 If a leak is observed the brake master cylinder must be replaced. Next, use a flashlight check the backside of each tire and look for leakage which will be obvious. Also check the brake line flex hoses. 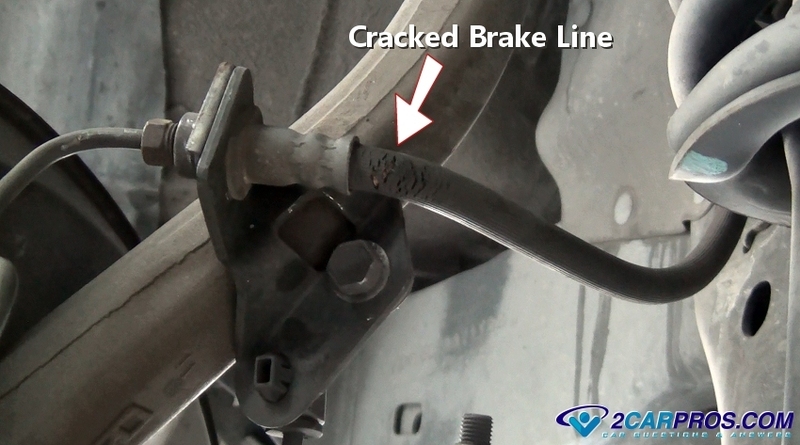 Here is what a brake line will looks like before it starts leaking. If the hose is wet fluid is leaking and the hose must be replaced. 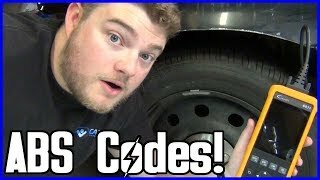 If the backside of the tire is wet with fluid either you have a brake caliper that is leaking and must be replaced or a wheel cylinder that has gone bad and needs replacing. Both of these problems allow a fluid leak through their brake fluid seals. The lack of brake fluid in the system causes the brakes to be on the floor. If the brake fluid is full and the pedal still drops you have a different set of problems which are listed below. At this point the brake warning light may or may not be on. 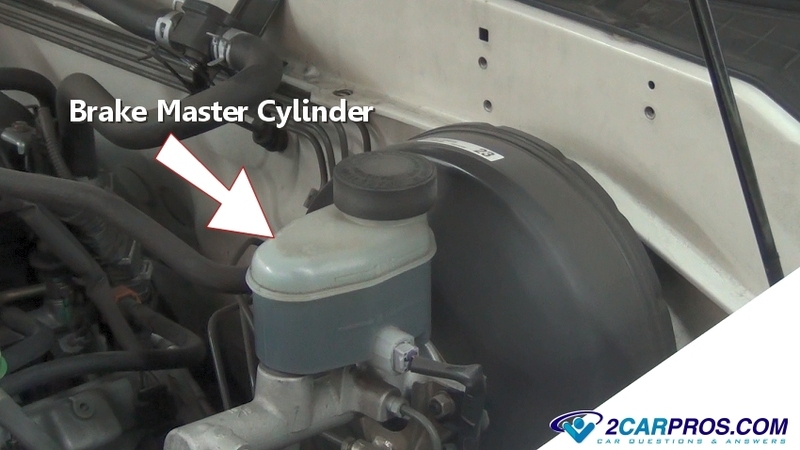 A Bad Brake Master Cylinder: A master cylinder had two sets of internal seals which naturally wear from usage and when they fail cause the fluid which is normally pressurized inside the master to bypass backward into the brake master's fluid reservoir or leak out from the rear of the unit. 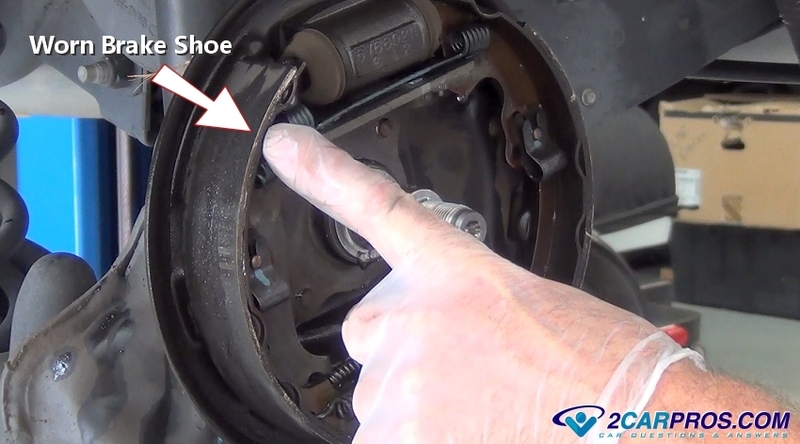 This failure can create an intermittent brake pedal fade. Pumping the brakes can cause these seals to expand and may help the brake master start working again. 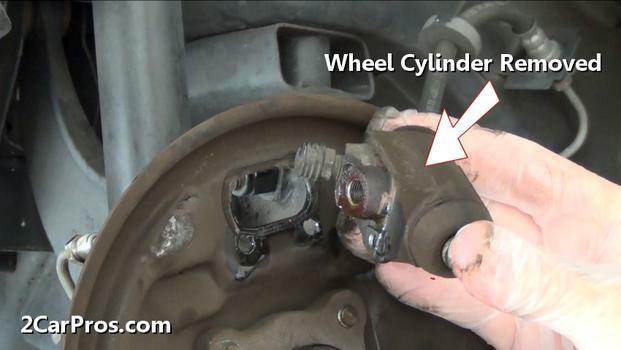 When this failure occurs, the brake master cylinder must be replaced with a new unit. Bleed the Brake System: Air in brake system can cause the system not to pressurize or pump up. Air can enter the system from any components that utilize a rubber seal such as the: brake master, caliper or wheel cylinder. This conditioner can occur even though the seals are not leaking externally. This is because these seals are made to withhold fluid while being pressurized. The problem occurs when the brake pedal is released at which time suction is introduced to the system while the pedal is returning to its normal position. 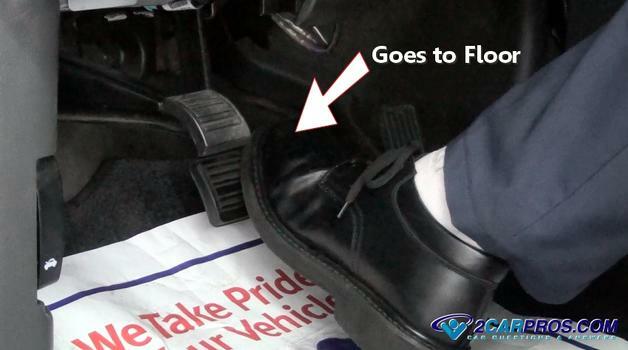 At this time air can be pulled into the system in small quantities which causes the brake pedal to be near the floor. Bleed the brake system while checking for air in the form of bubbles being released from the bleeder screws and replace the brake components which air is observed from. Check the Brake Shoe Wear and Adjustment: When your car's rear brake shoes wear down due to normal usage the self adjuster which is positioned between the shoes should expand repositioning the shoes closer to the brake drum. If this mechanism fails to adjust the shoes outward or if the shoes become worn beyond their limits it will cause an extended air gap between the shoe and the drum. This air gap will cause the brake pedal to travel downward beyond its normal throw. In either case the brake shoes will need to be replaced or adjusted. The final reason for a brake pedal to go to the floor is failing axle bearing. Axle bearings hold the brake rotor true without play while they both rotate. 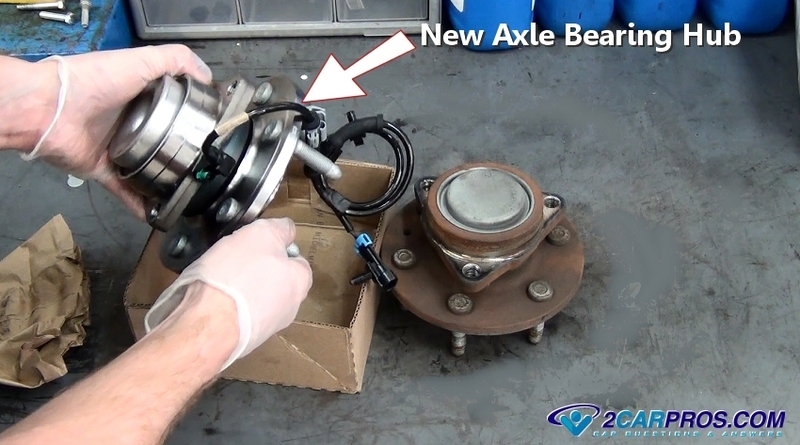 If this bearing goes bad it will allow the brake rotor it move back and fourth which pushes the caliper piston back into the caliper creating an air gap. This problem typically occurs after driving for sometime or after turning a hard corner. The pedal will go to the floor as the caliper fills with fluid to close the gap. In this case it will take two or more brake pedal pumps to regain its normal operation. If you have exhausted all other problems check the axle bearings for play and replace any that are needed. If you have any questions about a brake pedal that goes to the floor please visit our forum. If you need car repair advice, please ask our community of mechanics is happy to help you and it is always 100% free.